Crayfish are also referred to as crawfish, crawdads, mudbugs, or freshwater lobsters. 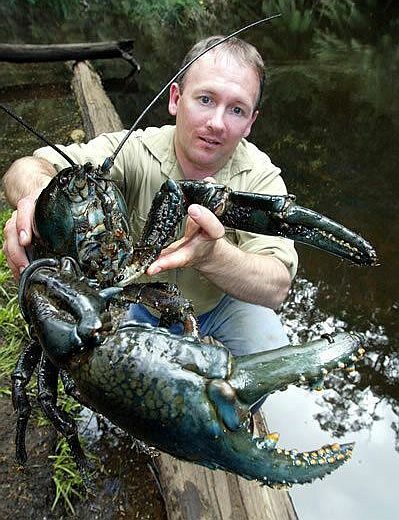 They are freshwater crustaceans that resemble their saltwater cousins, lobsters, to which they are closely related. There are well over 150 different species of freshwater crayfish worldwide which can live an average lifespan of 2 to 6 years, some even longer. Crayfish breathe through feather like gills and are found in both slow and fast moving bodies of water. The majority of species are found in streams and small brooks in fresh running water. Other species thrive in swamps, ditches and in many areas are cultured in rice paddies. 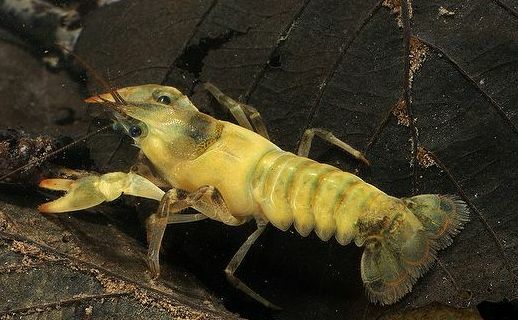 Most species of crayfish cannot tolerate polluted water however, some invasive species like (Procambarus clarkii ) are much hardier. Crayfish are fascinating creatures that come in a variety of colors and can be quite entertaining to watch. Many tropical fish keeping enthusiasts eventually wind up keeping Crayfish in their tanks. Their color variations range from brown (the most common), red, yellow, green, blue, albino and several other combinations. Most people acquire their first specimens by collecting them from a local stream, a slow moving area in a river or from a backwater in their local lake. The more colorful specimens can be ordered online from almost anywhere in the world if your local aquarium store cannot get them for you. Before you bring your crayfish home, make sure you have a separate tank set up for them. Crayfish require at least a 10 gallon tank if you are keeping only one specimen. Because crayfish are very territorial, they will do much better and demand less care when housed in a much larger (30 to 55 Gallon) tank. Crayfish are “diggers” and love to burrow, so set up your tank with the smallest size gravel you can get or just use sand as a substrate. Include some rocks, a hollow log or cave decoration, or a clay flower pot for them to hide in. They are active but naturally shy creatures and you can expect your tank decor to be rearranged withing a day or so after introducing them. Most activity occurs during the evening hours or during low light conditions. Do not use live plants in your tank. Crayfish are omnivores and will enjoy eating them. Use plastic plants for decorating. Your crayfish tank should be set up just like your tropical fish tank. Use a good filter and heater if necessary, NO NOT use an underground filter. Since most North American species are cold water, you can probably do without a tank heater. You will need one if you purchase any of the Australian, Tasmanian, Asian or South American varieties. In the wild, Crayfish feed on living and dead animals and plants. They are scavengers and will leave uneaten food on the bottom of your tank. A 25 to 50% weekly water change will take care of this problem and keep your specimens healthy. Like their saltwater lobster and crab cousins, crayfish molt and shed their exoskeletons as they grow. They need an alkaline environment a lot of calcium in their diets. Add a few drops of liquid calcium to their water on a daily basis during the molt to help them along with the process. Crayfish are great fishermen. They will perch themselves with their claws wide open and wait for a passing fish to swim by. Unless you don’t mind having your tropical fish eaten by them, don’t mix crayfish with other tropical fish. Crayfish are scavengers and will eat animal and vegetable matter. Feed them commercial foods such as shrimp pellets , shrimp pellets that you give your Plecostomus, freeze dried or most large flake foods. High calcium foods like fresh spinach, raisins, zucchini, leaf lettuce, squash, etc. should also be fed occasionally, but be sure to remove any uneaten food after a few hours to ensure water quality. As your Crayfish grow they will shed their old exoskeletons and in a couple of days grow a new replacement. During the molting process they will also replace any legs or claws that were lost during friendly skirmishes. During this “soft shell” stage they are extremely vulnerable and will hide in your tank. Don’t think you lost your specimen when you see what looks like a dead crayfish on the bottom of the tank; it’s just the old exoskeleton. 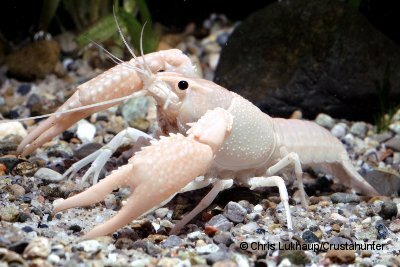 Most Aquarius pull it out of the tank but the crayfish will usually eat it when their new skeleton hardens up. As noted above, adding a few drops of liquid calcium to their water on a daily basis during this period will help them along and speed up the process. 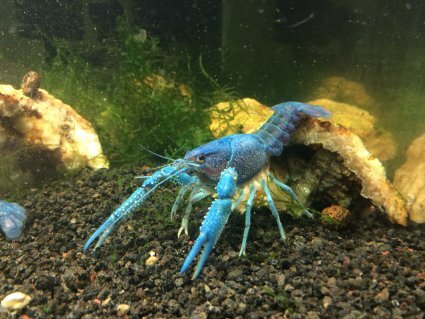 After the molt, don’t be surprised if your crayfish looks bigger or it changes color, this is perfectly normal. 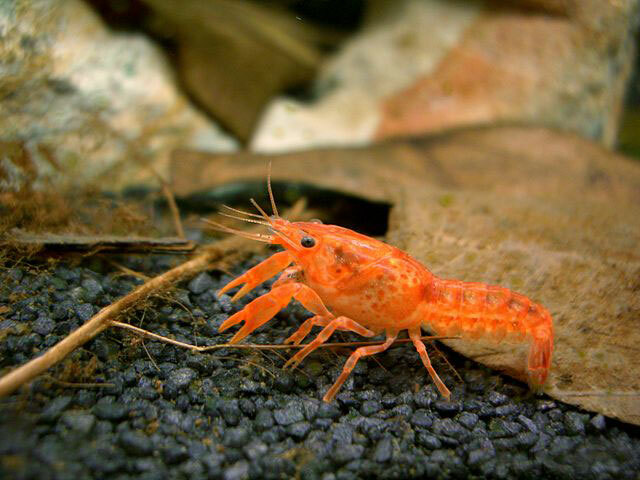 The life cycle of Crayfish is fascinating to watch and given the proper care, they will reward tropical fish keeping enthusiasts with years of enjoyment.